New Delhi: With their eyes set on a berth for the 2018 World Cup, the Indian women's team will leave on Saturday for the Hockey World League (HWL) Semi-Final in Johannesburg, starting 8 July. The 18-member Indian team, led by striker Rani, has been training in New Delhi for the last six days before leaving for the World Cup Qualifier. "We played a couple of matches over the past one week against U-18 Boys. The whole idea of playing these matches was to see how the team copes with handling speed considering the boys play faster hockey. The physical aspect too was put to test," stated chief coach Sjoerd Marijne prior to their departure from New Delhi. Earlier this month, the squad trained at the SAI Centre at Shillaroo to get acclimatised to the testing conditions in Johannesburg. 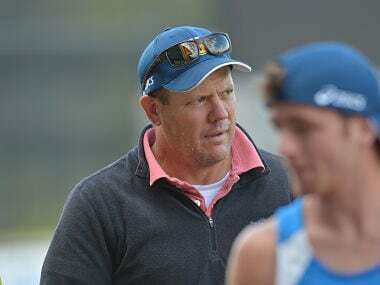 Under Scientific Adviser Wayne Lombard, the team was put through intense training, with focus on improving speed, agility and attaining a greater level of fitness. "We would do four sessions a day and it is not easy training so hard at high altitude. The sessions were very challenging but the girls are eager and excited to earn a berth for the World Cup," said skipper Rani. "Barring a couple of us in the team, most of them have not participated in a World Cup event and that anticipation is driving the team to give their 100 percent each session, each match and I am confident of a good show," she said. Ahead of their first Pool B match against hosts South Africa, the team will play two practice matches against England and Ireland on 3 and 5 July respectively. "We can test ourselves against these two countries and analyse the areas we need to improve before we play our first match. While the recent camp was focused on improving speed and fitness, we also worked individually with strikers, midfielders and defenders, created more awareness about the techniques and strategies we need to adapt to and I am happy with the kind of progress the team has shown," Marijne said. India are grouped with South Africa, USA, Chile and Argentina. The chief coach insisted that the team can excel if they stick to the structure and execute the plans effectively. He said they would not want to repeat the mistakes they made against New Zealand where they were whitewashed in a five-match series in May this year. "Here in Delhi, we tried out different activities in which tennis too was one of them. I wanted the girls to understand what unforced errors are in tennis. When we played against New Zealand last month, it's not that we played badly but we made unforced errors which led to them scoring many goals. If we can avoid these slip ups then I believe we stand a good chance," stated the Dutchman. India will take on South Africa on 8 July at 2130 hrs IST.